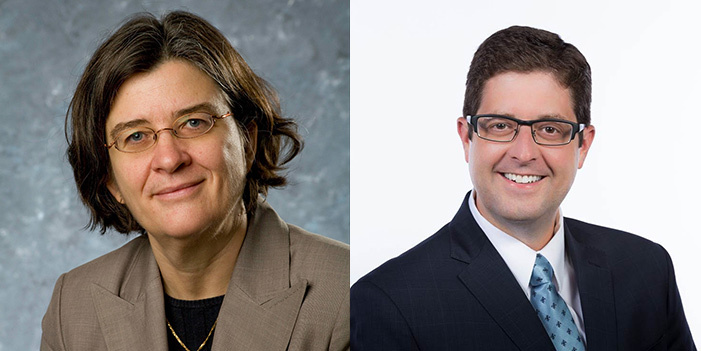 Two UNB law faculty members have been given the esteemed designation of Queen’s Counsel. The award, known informally as “taking silk,” was bestowed upon former UNB law dean and current professor Anne Warner La Forest and part-time instructor Scott Brittain. Lieutenant-Governor Jocelyn Roy-Vienneau conferred the appointments at the legislative assembly in Fredericton on Oct. 29. Nine other lawyers were also given the honorary title as a result of their high level of personal and professional integrity, and for their outstanding contributions to the legal profession. Professor La Forest and Mr. Brittain are well known for their contributions both at UNB and provincially, and over the years they have deeply enriched the lives of many UNB law students. Highly respected among UNB students, faculty, staff, and members of the law community, Professor La Forest graduated from UNB Law in 1984 and served as dean from 1996 to 2004. She has been involved in many research projects and has authored a number of legal journals, articles and books. Primarily focusing on the study of property, international law, international human rights law, private international law, administrative law and corporate governance, Professor La Forest has been a visiting fellow in the Harvard Law School Human Rights Program and a visiting scholar-in-residence at the Department of Justice in Ottawa. “I am grateful to the Law Society of New Brunswick and the selection committee chaired by Chief Justice Richard for recognizing the legal contributions of those in the profession who work in academia and train the next generation of lawyers for the province,” says Professor La Forest. Mr. Brittain graduated top of his class from UNB Law in 2004 as a Beaverbrook Scholar in Law. He went on to study at the University of Cambridge where he graduated with his master of laws. He has worked for the City of Saint John’s legal department since 2007 and practices municipal and community planning law, litigation, labour, employment and administrative law. Mr. Brittain is immediate past president of the Saint John Law Society and of the New Brunswick branch of the Canadian Bar Association. He is vice-president of the Law Society of New Brunswick, a long-serving member of the UNB Board of Governors and serves as a part-time instructor at UNB Law. The following New Brunswick-based lawyers and legal scholars also received their Queen’s Counsel designations on Oct. 29: Anik Bossé, Guy Dumas, Edward W. Keyes, Deloras M. O’Neill, Linda Boudreau, Robert M. Dysart, Lyne Raymond, William C. Kean and Grant Ogilvie. Photos: UNB Law professor and former dean Anne Warner La Forest (credit: Rob Blanchard/UNB) and UNB Law instructor Scott Brittain (credit: James Walsh) received their Queen’s Counsel designations on Oct. 29, 2018.